Welcome dear friends. Hope you are enjoying this beautiful season. I have so many things to share and will try to do so in the next few posts from now to Christmas. I think I am finally finished in the studio and looking forward to a welcome break and the chance to meet with friends and enjoy the holiday putting my creative side on hold (this is not possible, lol) till the new year! First I like to share 2 awards given to me from Sandi from Bearly Sane. Congrats to you Sandi on receiving these. You are so deserving. This award is one with 7 things about you to pass on. Pick 7 more bloggers and give credit to all. Well, I am so honored dear Sandi and thank you so very much. I will have to bend the rules a bit though. Due to my busy schedule, I will pass this to anyone wanting to participate. Take the awards and enjoy, but please do visit Sandi when you can. She is an amazing bear artist and designer. 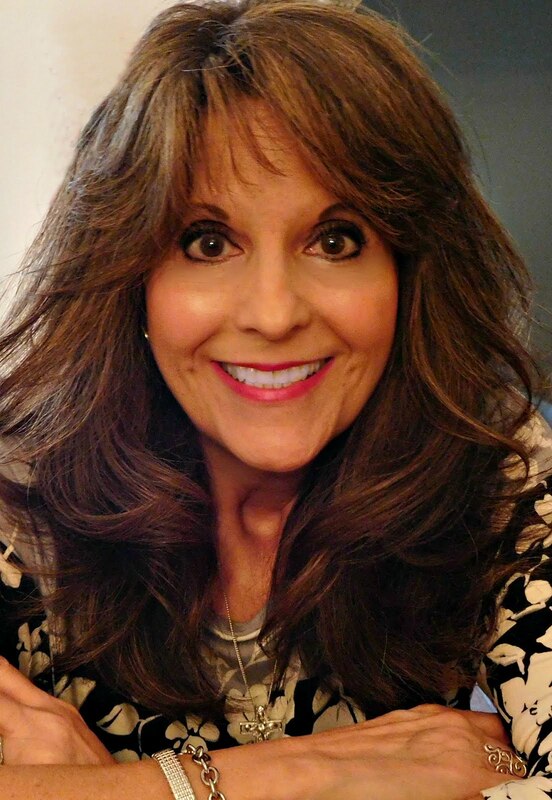 You will enjoy her blog and personality. 1.) I play the piano, clarinet, autoharp and guitar. 2.) I am a semi vegetarian. 3.) I have moved 10 times and owned 7 homes. 4.) 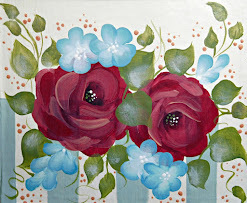 I started out painting in oils and watercolors, many years ago. 5.) I was encouraged by my 5th grade teacher to pursue art, she entered me in the Henry Ford Museum Art Fair in Dearborn, Michigan and I won First Place for a Mosaic. 6.) I used to be a hair model. 7.) I was in a documentary for ABC local news on pedicure spas. (was a nervous wreak)LOL!! That's it, my 7 things. Thank you Sandi for the awards. This seems the perfect way to transition into my new direction for the new year of an award free blog. The reason mainly is I have heard from many that the load time for my blog and others takes too long. So, I plan to take these pics off helping to make my blog easier to load. Right now they are in a second blog if you'd like to visit. Click the angel at right or below. 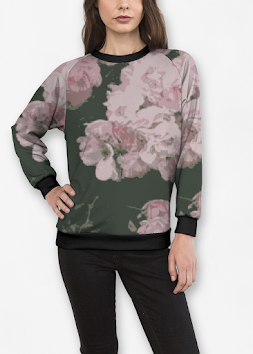 I also wanted to share a few pretty treasures that have come my way from blogland friends. Pretty greetings and cards from dear Julie Marie and Marie Antionette. From the chain letter Ornament swap, sweet Lorena from Rose Chic Friends, sent a pretty wood cross with her hand molded clay roses. Marie Antoinette sent one of her gorgeous wall hanging stockings (GORGEOUS)10 specially made Christmas CD's, rose scented potpourri all in the darling box with Santa getting ready for gift giving! I also did some shopping with Amy from Bunny Rose Cottage. She had these darling heart pockets she created and I adore this one. It is so pretty! More shopping with Betzie from Time Enough and I found this gorgeous bracelet treasure she designed. It is amazing!! She also added in the earrings, soap and this gorgeous reversible victorian tag! Julie Marie from Idylhours sent some skates to paint. One tiny little pair and the other a larger pair of skates. I did not get the larger painted yet, but did manage to finish the small tiny pair. They are so cute and look like they could be worn by a 3 year old. Just adorable. I have them displayed in my shabby cottage room by the tree. I will share pics from that room next week, but for now, here are the pink rose skates! Jenn from Petal Palace also tempted me with her treasures so I shopped with her too and added her faux cookies to my tea table in the shabby cottage room. Tammy from A Stitch in Time, had this gorgeous handmade Christmas Stocking and, well, it looks perfect in the shabby room. The little one is from her talented hands too. 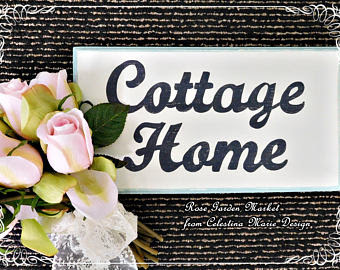 Jan from Rose Haven also had a lot of patterns for home decor to offer and again I found myself dreaming of the future and what I can create for my cottage. I can't wait to start with these. And, okay, I can't stand it, here is a first peek at the pink tree. It is daytime so the pics not as vivid as it will be in the evening. But this tree is graced with pink roses, vintage ornies,collectibles, shabby rose hand painted designs with silver and white glass ornaments and my mothers hand stitch snowflakes. I have so much more to share as the days approach Christmas, so I hope you will stop back again on your visits around blogland. Lots of decorating, visits with friends, cooking, baking and gifting. But the most fun I am having, is shopping this year for my secret Christmas gift through Church. This year I have an elderly man in a nursing home and I am having so much fun making a basket of goodies for him. Last year I had a little girl which was also lot of fun, so this is the opposite end of the gift ideas. The nursing home Christmas gift is near and dear to my heart. But I am truly the one receiving the gift as I shop for this gentleman. It is a blessing indeed! Here are the links to those I mentioned above. When you have the time, stop by and visit these sweet ladies. Thank you so much Ladies. All the rest were featured in another post for the Chain Letter Christmas swap sharing those gifts. 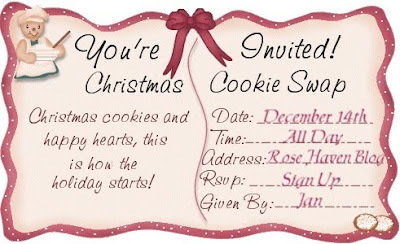 Lastly, I want to invite you all Monday, Dec. 14th for fun at a cookie recipe exchange hosted by Jan from Rose Haven. Click on her link above and sign up if you'd like to participate or just pick up some new recipes. It will be fun. Thank you for stopping by and staying for this long post. As you know, I like to keep them shorter, but sometimes it's not possible. I'll be back soon to share more decorating for Christmas, trees, village cottages and my favorite of all, nativity scene hand painted by my mother. I hope you are enjoying the season and remembering the reason.